Domain brokerage company MediaOptions.com, whose founder & CEO, Andrew Rosener, was interviewed in our September 2012 Cover Story about the brokerage business, announced a key addition to their management team today. 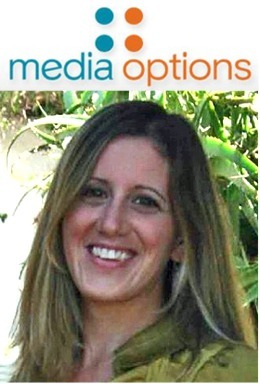 Tess Diaz, one of Go Daddy's longest tenured (6 1/2 years there) and most respected Executive Account Managers, has accepted a new Coordinator of Business Development position with Panama-based Media Options. CEO Andrew Rosener said Tess was the person who got him interested in the domain business in the first place. Rosener said, "I couldn't be happier to have the opportunity to work even more closely with Tess. For the past six years Tess has been a critical advisor and assistant to our business in her role at Go Daddy as our Executive Account Manager, but now that we have her full time and attention, I look forward to the improvements and innovation she'll bring to the team." Options team. Media Options is such a responsible and respected leader, particularly in increasing end-user perceptions on domain value via education and their own portfolio of online businesses. Together, our clients can expect to experience Media Options' established results through our ongoing commitment to improving efficiency and effectiveness." Elsewhere, Nominet's controversial plan to introduce .uk domains that would compete with the long established .co.uk extension that Nominet already administers, resulted in a dire prediction of dramatically reduced .co.uk values being issued by DomainIndex.com today. The domain name benchmarking, rating and appraisal service, said DomainIndex.com "believes the introduction of the .uk TLD would massively destroy the value of existing .co.uk domains and in fact Nominet´s announcement already inflicted harm to the value of .co.uk domains and the aftermarket, as well as the investment climate in the .uk TLD. Our analysis of the proposal, which Nominet defends as a move to increase Internet Security, would have several adverse effects." The adverse effects DomainIndex predicts are detailed here. In news from another TLD, Telnames is trying to breath some life into the .tel extension, that has been rarely seen since its 2008 birth, by releasing a new Mobile Website Builder app for the iPhone that was announced today. The company said the app, now available as a free download from the Apple App Store, "enables professionals and businesses to buy and create their own mobile-friendly website in less than 10 minutes with just their thumb." involved in buying and building a mobile-ready website. From today anyone, regardless of technical ability, can get their own place online in a matter of minutes." More information on the application and Telnames can be found at http://telnamesapp.tel.